The diamond bikini is created by Susan Rosen with Steinmetz Diamonds and has more then 150 carats of D Flawless diamonds. The item is at the same time the most expensive diamond jewelry and the most expensive bathing suit. 2. 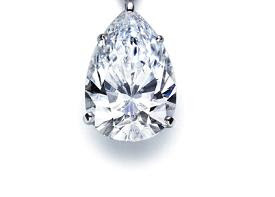 White Diamond by Sotheby’s – $23 million. 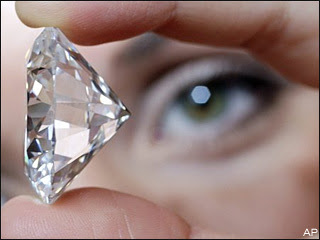 The white diamond belonged to the Sotheby’s auction house and had 100.1 carat. It was initially sold for $16 million but the current value reaches $23million. 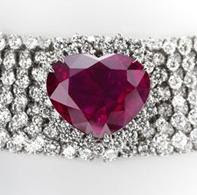 The romantic shaped ruby necklace that has as a centerpiece a 40.63 carat Burma ruby belongs to an English jeweler. It is mounted also with 155 carat worth of diamonds. 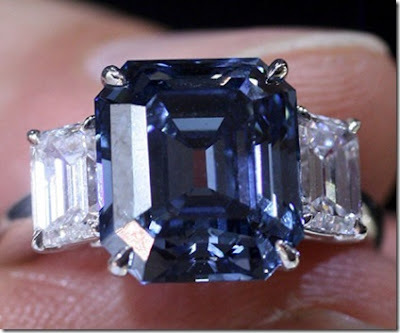 The Sotheby’s blue diamond has 6.04 carats and it is mounted in a superb rings that was sold in a Hong Kong exhibition at the amazing price of $7.98 million. 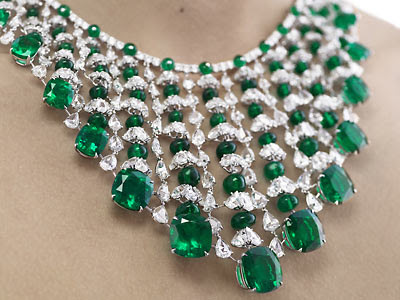 Chopard is presenting an exquisite diamond and emerald necklace which sums up 191 carats of Colombian emeralds. The price is believed to be around $3 million, but there is no certainty yet. The Tiffany diamond pendant is a simple but impeccably cut and precious pear-shaped diamond. The fitting is barely noticeable, thus the beauty of the 41.4 carat diamond accentuated. 8. 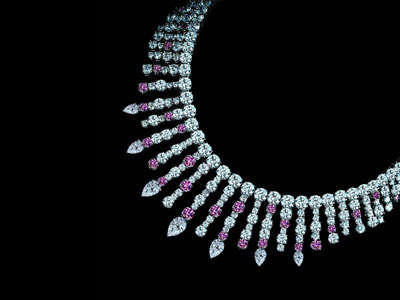 Diamond Necklace by William Goldberg – $2 million. 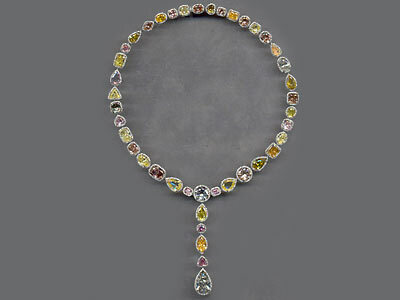 The William Goldberg diamond necklace is a colorful necklace full of fancy colored diamonds. The fancy diamonds on the necklace total 45 carats. The Graff diamond rings exposed a alluring and rare deep blue diamond. It is cut in clear emerald cutand wieghs 2.4 carats. The Leviev diamond necklace is made up of white and pink diamonds totaling 97.9 carats cut in a round or pear shape. It took more than a year to create this beauty but the waiting was worth it.